This essay is based on an earlier version that was first published by the Simplicity Institute in 2012. It was written before RetroSuburbia and focuses on the rational for retrosuburbia as way for society to sensibly address a host of sustainability, economic and social issues. It challenges academics, urban planners and policy makers to think more creatively about urban sustainability, and debunks the orthodox view of the urban planning profession that higher density development is more sustainable. The roll out of retrosuburbia should enliven urban planning debates! This essay uses the statistics of Aussie St to illustrate the potential of a larger-scale transformation of suburbia, and similar low density residential landscapes, into dynamic, productive and engaging communities. It is a good starting point for those promoting retrosuburbia as good for society. I first came across term “retrofitting” in the 1970s reading the Whole Earth Catalogue to describe the creative responses to make American homes more energy efficient in the first oil crisis. Retrofitting is generally associated with changing the built environment and technology to make it fit for new purpose. Similarly a “permablitz” makeover of an existing yard, or any other permaculture design process, reshapes the existing plants, structures, soil and water resources of the biological domain for abundance and resilience, tomorrow and into the future neither of these processes involve blank slate planning that completely replaces existing assets. A RetroSuburbia companion, a guide for behavioural change. While our fossil fuelled culture constantly focuses on changing the environment to meet our needs and desires, in a world of less, we will find that it is often simpler to modify our behaviour, habits and attitudes. Thus the retrofitting process can be similarly applied to transforming personal, household and community behaviour and organisation. My own lifelong experience with self reliant living, informed by permaculture ethics and design principles, has taught me that behaviour change is the “low hanging fruit”. This reflects the aphorism “change the world by changing yourself”. In a world of less, we will find that it is often simpler to modify our behaviour, habits and attitudes reflecting the permaculture aphorism that “the problem is the solution.” In the right conditions behaviour can quickly shift compared the physical and natural realities that govern the built and biological domains. On the other hand, entrenched dysfunctional habits can be stumbling blocks that lead to family and community break ups, failure to tale advantage of good design and action in the built and biological domains and resignation that a more self reliant and low footprint way of life is too difficult. For these reasons, a substantial part of the book focuses on the patterns of adaptive behaviour at the personal and household levels that can be the springboard for adaptive community level change. Retrofitting is a step between the slow incremental organic processes by which traditional peoples modified their living environment and the typical processes of the modern world where fossil fuelled debt finance quickly wipes away old patterns and ways with brand new projects. I see retrofitting reflecting the ideas of Christopher Alexander’s Timeless Way of Building (1975) and his Pattern Language (1977) by which we recognise what already exists as wholes that can evolve, differentiate and be renewed and revived in response to a world of change. While the retro style of the hipsters maybe could be nothing more than fashion, maybe there is a link between this fashion and the revival of the energy and enthusiasm for DIY tech, food growing and self reliant living not seen since the 1970s when permaculture last showed the promise of a grass roots transformation suburbia. In any case I think RetroSuburbia captures the ambiguity of a radical transformation for the future and the easy recreation of the best from the past. In this home territory I can show the strategies, technique and designs that work without the demands of publishers for universal solutions to sell to the largest market. Permaculture designers everywhere can readily adapt the solutions beyond this bioregion. If we can help trigger an order of magnitude jump in the number of household retrofitting projects that succeed on home territory, that could generate both positive and negative responses from academics, policy makers and corporations that might lead to media and broader public interest. If we succeed at that scale then the retro suburbs movement at home, will help inspire similar action around Australia and beyond. If this project aligns with your personal, household, enterprise or community level aims and action, sign up to the RetroSuburbia mail list to keep updated on our activities and latest releases. For almost four generations of Australians, the suburbs of our capital cities and regional towns have been the environment in which most of us were raised, and in turn raised our children. By the 1950s and 60’s the suburbs had become the default or even the natural human environment in English speaking countries, including Australia, New Zealand, Canada, and most influentially the USA. A combination of rapid population growth, cheap energy and abundant land around cities, and government policies and infrastructure, fueled the growth of suburbia and created a settlement and cultural model that has been progressively exported to the rest of the world. But the desire to combine the advantages of both the country and the city often generated the limitations of both. Beginning in the golden years of the 1950s and 60s, cultural and planning critiques of suburbia began to develop that have informed policies for medium density development, infill development, and city centre high rise, as alternatives to further suburban expansion. The underlying idea that informed these critiques was that suburban development is wasteful and inefficient in use of land, water, infrastructure and energy, and that the future will be one of constraint, requiring compact cities more informed by European development patterns. Over the same period a more radical view of future resource and environmental constraints suggested that our ability to maintain all aspects of globalised industrial modernity would be challenging if not impossible. From this perspective a relocalisation and re-ruralisation of society will be inevitable. Howard Kunstler, the American commentator on urban form, and more famously peak oil, summed up both these perspectives when he said the “suburbs are the greatest misallocation of resources in the history of the world” and “that they have no future.” While these perspectives and Kunstler’s statement have some merit, from a permaculture perspective, the suburbs are a great place for incremental retrofitting and behavioural adaptation that can be easily replicated in the energy descent future. For three decades permaculture as a design concept, tool kit of strategies and techniques, and a movement, has been at the forefront of personal and community responses to the sustainability of our settlement patterns. The main expressions of this trend have been successive waves of back to the land settlers on rural land where the ideals of raising a family on a small block of land is more feasible than in the increasingly overbuilt, overpriced and over regulated residential development on our metropolitan fringes. However, because of the downsides of relocation to marginal bush and rural properties, migration to smaller towns and settlements has gained in popularity. Making use of existing housing, infrastructure and (often) fertile soils of our existing settlements has worked for many, including myself (‘Melliodora‘ Holmgren, 1995). Avoiding the “children chauffeuring business” and recreating some of the lost benefits of the suburbs of the 50’s and 60’s are other advantages of the small town option. But the retrofitting of our existing suburban landscapes to make them more agriculturally and economically productive places that can sustain resident households and communities has always been central to the permaculture agenda. In the process our suburbs and cities become more livable places and our lifestyles more healthy. While implementing this agenda has hardly been a roaring success during the decades of affluence and growth, in-situ adaption might be the only option available to many during hard times. In a few countries such as Australia where the mining boom and the more long standing property bubble have continued to drive over-development, the debate over the relative merits of suburban vs. higher density development continue, but these debates are about to be swamped by the increasingly strident debates brought on by the “Second Great Depression” that has been unfolding like a slow motion train crash since 2008. While these debates over causes and blame will continue, the bursting of the property bubble is likely to stop new development in its tracks. Rather than just another reset of global capitalism, the current depression is likely to be the historic turning point for humanity from growth in energy use, monetary economies, globalisation, urbanisation and human numbers, to some form of decline, contraction or collapse that I call energy descent. While energy and infrastructure transitions that lead to greater complexity can take decades if not centuries of economic growth, energy descent transitions to less complexity through crises and collapses can occur more rapidly. However, short of catastrophic disorder, future generations will inherent and continue to inhabit the suburban housing and landscapes created in the fossil fueled boom of the 20th century. Without cheap oil and resources, freely available credit and a growing economy, rebuilding our cities along other lines will be recognised as a dream from the era of growth. Once the reality of energy descent (in some form) is accepted as highly likely, then a myriad of creative retrofit solutions for this energy transition can occur. Even a degree of uncertainty about sustaining growth suggests a very flexible approach that refocuses our individual and collective priorities to genuine needs rather than wants and addictions encouraged by media and advertising. Provision of basic needs rather than resource-expensive wants will dominate future policy and action. Simple and robust systems that are capable of being maintained without expensive and specialised technology. An acceptance that reduced mobility and reduced indoor built space per person will characterise future urban life. Progressive ruralisation of our settlement patterns and processes in which biological needs and functions of food supply, water and nutrient recycling will be fundamental to the redesign. Realisation that very high density buildings and very large cities will not be able to be sustained in the future. Relocalisation of our economies and decision-making structures. Staying at home and slowing down instead of always attempting to move further and faster. Creative ways to avoid unnecessary complexity and make work. Conserve what we have for the future instead of always trying to sustain growth with new cycles of debt. Even without breakdown of energy and infrastructure systems, the loss of credit in the money system that leads to the stalling of economic transactions results in rapid changes in human behaviour and social organisation. My ‘Future Scenarios’ work (Holmgren, 2009) explores a variety of energy descent scenarios that are influencing permaculture and transition activism at the household and local community level. While the prospects range from the challenging to the frightening, in-situ adaption to at least the early decades of energy descent will be the default response for most people. That suburbia will be transformed, there is little doubt, but that transformation is likely to come more via behavioural adaption, new household formation, and piecemeal and incremental retrofitting, than large scale transformation driven by government policies and bank financing. The experiences of rural resettlement and more particularly small town resettlement are directly and indirectly informing the current wave of suburban retrofit pioneers. I hope this work helps those considering a serious review of how and where they live or plan to live. I am also encouraging the pioneers to continue to refine and deepen the models, that will hopefully be adopted by others. I look forward to the economic contraction knowing that this drive the wider adoption of many of these solutions, with or without the support of sensible public policies to assist rather than inhibit the process. Since 2003 I have been giving presentations about retrofitting the suburbs as positive responses to climate change, peak oil and economic contraction. 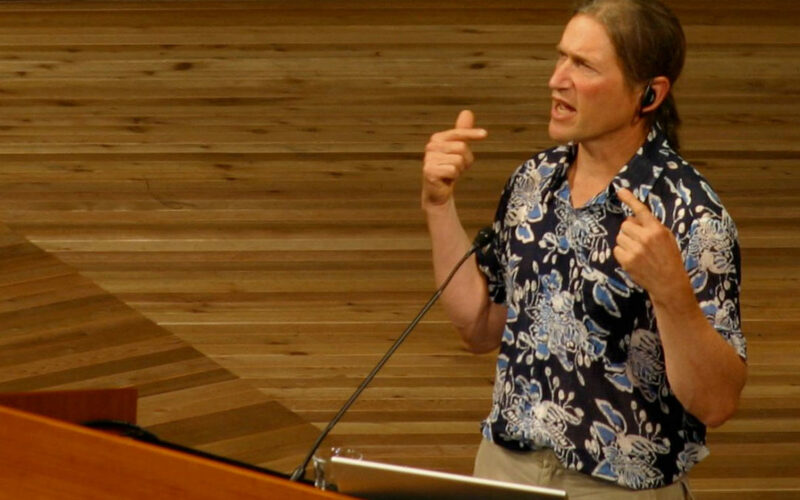 Most notably was the Australia-wide lecture tour in 2006 with leading American Peak Oil educator Richard Heinberg, in which Richard presented the “bad news” about peak oil, and I presented the “good news” about retrofitting the suburbs using permaculture strategies. The core of those presentations was a light hearted story that traces the changes in four adjacent suburban allotments in “Aussie Street” through the Golden Age of Suburbia (1950s), Rising Affluence and Additions (1960’s & 70’s), Aging and Infill (1990’s) culminating with The Late 2000’s Permaculture Retrofit which shows that the retrofits at number 2 and 3 Aussie Street provide a model of positive transformation while number 1 & 4 remain emblematic of past stages of suburban life. From the Aussie Street powerpoint presentation, available the resources page. At the end of the presentation I posed the question of how the positive changes at number 2 and 3 will influence number 1 and 4. The power of this presentation is that many people can relate to Aussie Street as representing aspects of the street they grew up in and because the changes are described in terms of personal and family change rather than demographics, economics, public policies and regulations. Nevertheless the presentation manages to show how these larger scale systemic forces play out as part of the story. Most significantly, the 4 stages of suburban evolution are tracked in terms of numbers of residents, persons per hectare, and floor area and floor area per person. What this thought experiment suggests is that the public policies that have sought to increase suburban density to make better use of public infrastructure and decrease pressure for urban sprawl have failed to halt the ongoing decline in urban residential density associated with rising affluence, smaller households and fragmenting communities. On the other hand, they did cover over more productive gardens, reduced opportunities of solar access, and reduced options for energy descent adaptation. For decades we have had a distracting debate between those favouring traditional suburban expansion at the fringe and those supporting higher density infill development. Urban planners, posing as environmental progressives, tend to favour infill development. This debate focused on our growing population (highest in OECD), resource efficiency and environmental protection has diverted attention from two ugly realities. Firstly, the strongest driver for growth is not population, but the desperate need to keep the bubble economy of building and development from deflating. Despite the endless propaganda to the contrary, the latest evidence suggests Australia (like the US, Ireland and Spain) has an oversupply of housing driven by credit expansion and collective belief in never ending asset price growth . Secondly the ideology, policies and development over more than three decades to increase population density have totally failed to stop the expansion at the suburban fringes. More strident calls for increased building density hide the reality of cities crowded with more and more buildings, housing fewer of us (per hectare) spending most of our time in other new buildings or going between them on crowded streets and public transport. Urban densification has become a cargo cult that has degraded our urban and suburban landscapes without achieving its stated objective of stopping the urban sprawl. The debate about urban density and infill development has been so myopic that increasing building density is taken as synonymous with increasing population density. Aussie Street shows the emperor of “urban densification” may have no clothes. Clearly if I had included redevelopment with apartments in my Aussie Street story, then actual population density would have risen, at the expense of even greater loss of energy descent adaption options. The increasing residential density shown by the permaculture retrofit in Aussie Street is only the tip of the iceberg. It is clear from the story that the trend is for the residents to be away from home more and more until the permaculture retrofit reverses the trend with home-based lifestyles and livelihoods. With a spreadsheet to calculate the time away from home (work, commuting, recreation, etc.) for each of my imaginary residents in each decade of Aussie Street, the following averages fell out of a first estimate. Time away from home is a good measure of demand on transport infrastructure, workplaces, schools, and other public facilities that occupy our cities and use energy and resources. As our suburbs became dormitories, minimally occupied during week days, our cities became more densely developed and crowded with cars taking people to and from poorly used buildings. The perception and resulting debate about development pressures in Australian cities often focuses on public perception of crowding (by people) when in fact our cities are full of minimally occupied buildings and roads to constantly carry people and goods to and fro. Time away from home can also be a rough measure of participation in the monetary economy both productive (paid work) and consumptive (commuting, school, child care, eating out, most recreation), while time at home is often more associated with activity in the non-monetary household economy whether that be as a producer (child care, housework, food growing, etc.) or as a consumer (eating, learning, recreating). Would proper research of hard data support my story of Aussie Street, and the assertions that come from this modest meta analysis? My challenge to academics engaged in the urban planning debate is to move beyond the same old lines that have dominated the debate over the last 40 years. I believe the behavioural and incremental retrofit of suburbia and similar density residential areas in our small towns and regional centres offers one of the best prospects for creatively responding to a wide range of issues and crises, whether or not those crises collectively represent the onset of the energy descent future that I and many others have articulated. At the very least we know from the history of previous depressions, wars and other crises of modern capitalism, that when times are tough, adaptive personal and household strategies are how ordinary folk cope. As opportunities in the monetary economy contract, the non-monetary household and community economies of gifting and bartering grow rapidly. (This process is now clearly evident, for example, in Greece and other countries hit by the sovereign debt crisis.) As costs of living rise and insecurity increases, household size also tends to increase (e.g. adult children stay at home, aging parents move in with adult children, shared households and more boarders joining existing households, etc.). As the cost of basic essentials (e.g. food and fuel) rise, at least relative to luxuries, then growing food and simple maintenance replaces commuting and travel as defining activities of daily life. I believe permaculture and related concepts that are already driving a bottom up renewal of suburbia and similar density residential landscapes in our country towns are the best way of kickstarting the non monetary household and community economies that we will need in the era of energy descent. Of all the strategies associated with permaculture, WWOOFing and other networks of live-in volunteers helping with food growing and other productive activities, are modelling how larger households can be more productive, interesting and resilient. The failure, over more than three decades, to achieve the permaculture retrofit of suburbia can be attributed, in large measure to persistent structural obstacles in our economy. On-going building and infrastructure growth supported by credit expansion has been the primary mechanism for sustaining growth in GDP in consumption saturated economies. Home ownership becomes more dependent on debt and double incomes. This led to a collapse in household economies as more and more functions of the household, such as food production and preparation, child rearing and education are outsourced to “professionals” in the monetary economy. In the process, the demand for more buildings and infrastructure (workplaces, shops, child care and entertainment venues) expands, further boosting the building and development industry and GDP. If governments were serious about reducing demand on overcrowded roads and public transport, reducing greenhouse emissions, ecological footprint, reducing household debt, increasing community cohesion and a myriad of other benefits, then they would have public education and incentive programs to encourage home owners to rent out a room. By taking in a boarder, mortgages can be reduced, household economies of scale improve, informal neighbourhood watch and childcare all contribute to stronger and more resilient communities with better use of existing infrastructure. The downside of such a public policy would be the proportional contraction in the building and development industry, and decline in corporate profits and government revenue to the extent that the increase in household size kick started a revival of non-monetary household economics. It is easy to see why such policies are never discussed let alone implemented. While the policy “downsides” of these changes expose the dysfunction in our political and policy institutions, there are also serious psycho-social impediments to sharing our houses. Most homeowners baulk at the idea of sharing their houses because of the loss of privacy. After spending 60 plus hours a week at work and in public, many people use their homes as private sanctuaries to close out the world (except media that one can turn on and off). On the other hand, older people at home, often value company provided by boarders as shown by programs to match University students from the country to older owner-occupiers with spare rooms. I believe there are deeper psychological reasons that inhibit people from even considering sharing their house, despite the obvious financial advantages. It is the fear of a tenant taking advantage of oneself. At first this seems illogical because a landlord, especially in one’s own home clearly has a distinct power advantage over a tenant, (that no tenant’s rights legislation can ever undo), so why should owners fear being taken advantage of by a boarder? In multi-generational affluent middle class Australian society we like to think that we are all equal. The idea of exercising power over someone else to protect our interests is distasteful, especially when the relationship includes the intimacy and empathy we associate with being part of a household (or even family). I believe this distaste is so strong in the middle class Australian psyche, that we tend to fear we would either let our tenants take advantage of us or alternatively get so angry and upset before we moved to circumscribe or terminate a dysfunctional tenancy. Inexperience and fear of dealing with conflict rather than conflict itself, maybe the biggest internal roadblock to building larger functional households. In 2011 I updated my presentation of the Aussie Street story with another slide showing what happens in the street once the second great depression is well established (notionally in 2020). The early adopters of energy descent at numbers 2 and 3 Aussie Street become the agents and magnets for creative change at number 1 and 4. However these changes are much less comfortable and come about through collapsing property values, mortgage defaults, fires, demolitions and squats as well as creative responses that see the people count rise and hours away from home decline. The non-monetary household economic production in Aussie Street overtakes what the first residents achieved in the early post WWII years. This most complex transformation is achieved with high unemployment and underemployment, contracting government services and most significantly, the absence of banking credit, similar to that already unfolding in several European countries. More negative analysis of the energy descent prospects for long affluent countries with large household debt levels, minimal experience of self reliant living or conflict resolution, suggests much harsher outcomes than occurred in collapsing economies such as Russia or Cuba (early 90’s) or Argentina (early 2000s), but at least in Australia we don’t have to worry very much about freezing in the dark of a northern hemisphere winter with no food. Our relatively benign climates and ability to grow and/forage some food all year round should be reasons to see that the retrofit of suburbia in Australia and New Zealand has many advantages compared with continental North America or even the UK and Ireland. In addition to these inherent climatic advantages, the economic conditions that are already unfolding in Europe, North America and other long affluent countries should be fair warning that we need to begin immediately to get our priorities straight to prepare for adapting in place, wherever that might be. For most Australians that place is suburbia. In the process we bypasses irrelevant ideological impasses generated by left/right political ideologies or pro development vs. environmental conservation agendas. I believe the evidence of global instability leading to energy descent if not total collapse is so overwhelming that it is incumbent on everyone to begin taking personal and household responsibility for reorganising their lives to adapt in place (or consolidate with family or friends in more suitable places). Paying off debt, our kids learning to garden, and turning our hobby into a business is not going to solve the problems unleashed by permanent energetic and economic contraction, but after forty years of public policy denial of the limits to growth conundrum by government, the media and other sources of power and public policy, the bottom up adaption strategy is the only one with any remaining utility. Many of us who have been on this path for a long time, know that personal and household level change is not enough. Community gardens, Permaculture, Transition and similar groups, Local Energy Trading Systems (LETS) and Co-operatives, Community Supported Agriculture (CSAs) and other strategies for community adaption and economic relocalisation have also absorbed our energies. More generally, effort to get governments to actively respond to the crisis should be replaced by efforts to reduce the regulatory impediments to the revival of household and community economies. In any case, without workable and attractive examples of household level transformation everywhere, then our residential landscapes being a wasteland will become a self-fulfilling reality. Join or form a local permaculture, transition or other group building local resilience. David Holmgren, 1995. Melliodora: Ten Years of Sustainable Living. Holmgren Design Services, Hepburn, Victoria. David Holmgren, 2009. Future Scenarios: How Communities can adapt to Peak Oil and Climate Change. Chelsea Green, Vermont. Readers can watch my Aussie Street presentation on the resources page. Willing Workers On Organic Farms is a world wide network exchanging food, accommodation and learning opportunities for work to help maintain and expand organic food growing and associated productive activities, that has spread from commercial farms to self reliant rural households and now suburban retrofitters. Current global events are so unpredictable and unstable that this scenario could begin next year or be miraculously held off for a decade. For further information and engagement subscribe to our email list at the bottom of this page. Reading THE Book. Life changing and very informative. FYI – link to the Powerpoint presentation on both screenshots of Aussie St. leads to the staging website (https://staging12.retrosuburbia.com/resources/), not the presentation. Thanks for letting us know, Darren! Our IT guy will look into it.